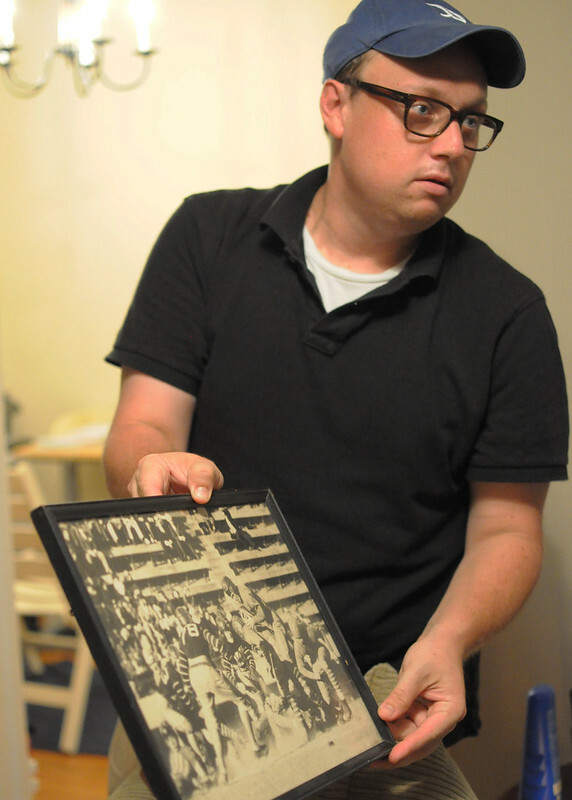 If you follow local Del Ray news then you most likely know Drew Hansen, editor of the Del Ray Patch. But if you don’t know him personally, chances are you’ve seen him at one of our local community events or logging office hours at St. Elmo’s Coffee Pub. We officially met Drew last year and we were thrilled when a random conversation ended with him asking us for help decorating his apartment. We’re not interior designers, but we do love brainstorming ways to rearrange furniture, pondering decorating styles, and sharing some of the interesting ideas we’ve seen at other homes in Del Ray. But we also noticed a few things about Drew too — he’s laid back, down to earth, and seems to have a great interest in history and cool retro artifacts. To help guide the decorating process, Drew, Leslie and I devised a style for Drew’s apartment mixing items he already owns and his personality. We call it the “Urban Cabin.” What’s an urban cabin? It’s a space filled with warm natural tones and textures with a nod to modern lines and a smidge of vintage whimsy. Yes, we made this up. Here’s a visual representation. So how do we propose to turn Drew’s current bachelor pad into a cool urban cabin? 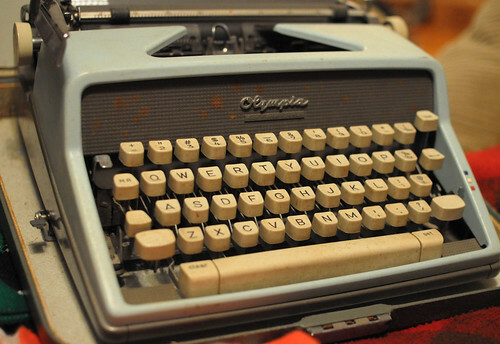 We love how items Drew already owns could be used throughout the apartment to add a personal touch and some retro style such as this typewriter (passed along by a family member). 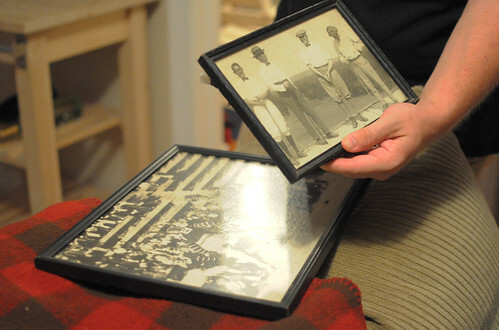 And these family photos, taken with former president Warren G. Harding. 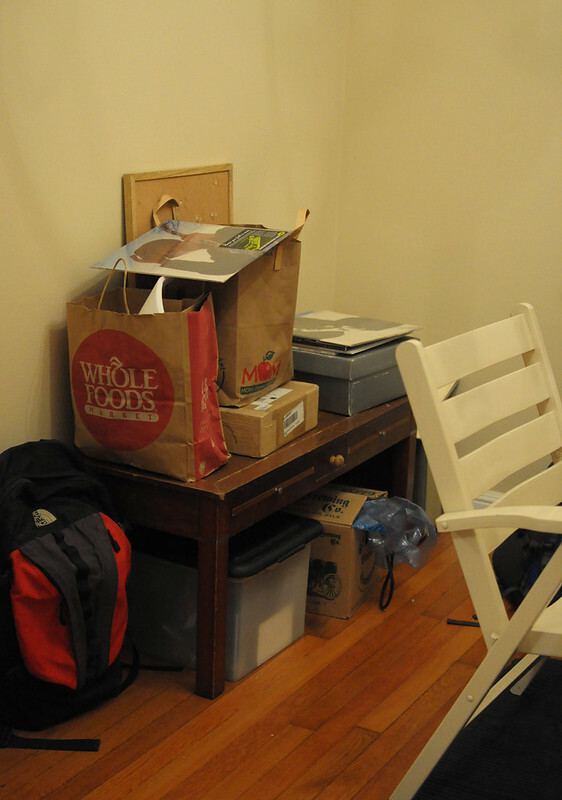 In the dining room-turned-office (aka Del Ray Patch HQ), the desk works (though needs a few organizing accessories), but the temporary deck chair is sorely out of place. My back hurts just thinking about sitting in it. Over the desk, we envision either a vintage map or a current map of Alexandria and some chalkboard decals to post important reminders (note to self: don’t forget the city council special election Tuesday night). Chalkboard decals can be purchased at Crate and Barrel outlet and they don’t damage walls, something renters should be cautious about. Also, for hanging posters and prints, Drew should check out the variety of products available that leave no mark on a freshly painted wall. 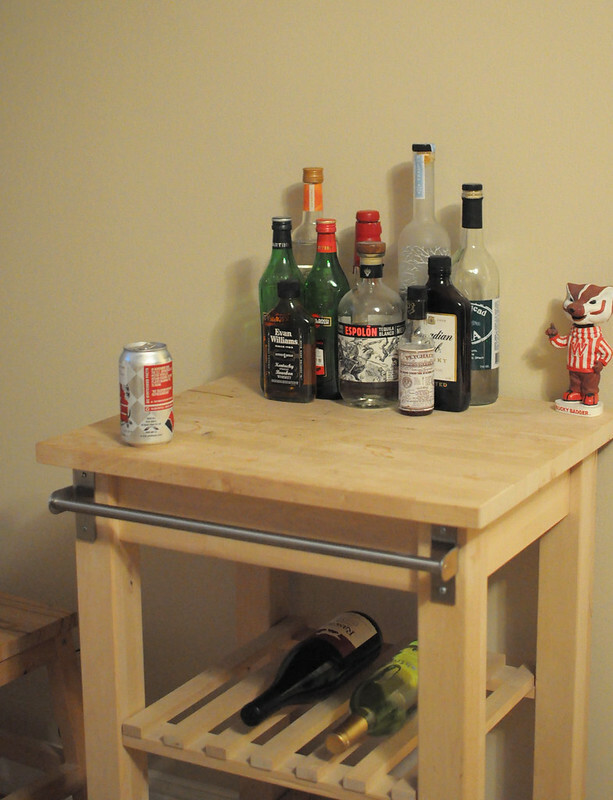 Furniture-wise, this IKEA kitchen cart used as a bar in the living room stuck out the most. Let’s move it back to the place it belongs — the kitchen! And in the cart’s place, Drew should get a more substantial bar — perhaps a repurposed console table, buffet, or chest of drawers. 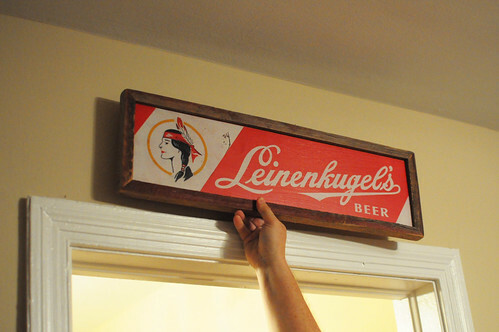 We favor something with character (think used) — either mid-century modern or vintage/antique. The bar should be wide enough so there is space for storing bottles, a cool set of glasses, and other bar accoutrements. We could even imagine a box displaying his LPs, with the record player underneath. The local antique stores, Craig’s list, and Freecycle are great places to start searching for a unique and sophisticated piece. At night, a single overhead light in the living room is uncomfortable. 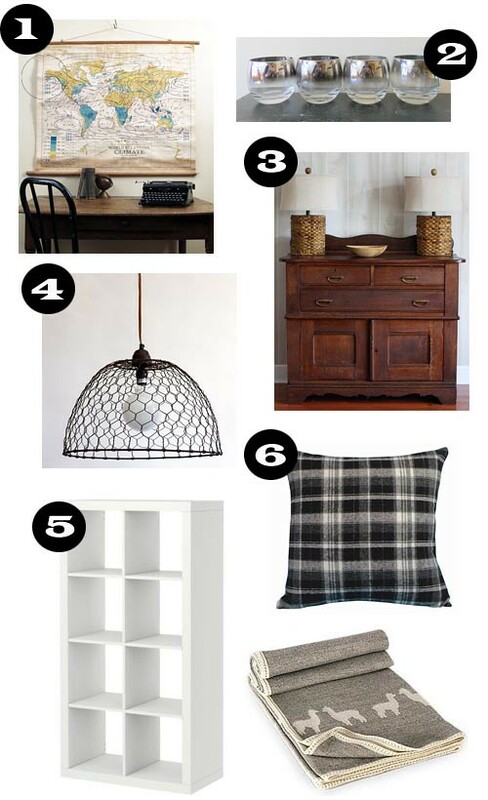 Instead of relying upon one central lighting source, we think Drew should get some table lamps and a floor lamp to make the lighting softer, like the glow of a cabin fireplace. This basement remodel has some great examples of smart lighting choices. Also, a funky DIYed pendant lamp from a wire basket would be a nice touch over the bar. The pendant can hang from an existing plant hook in the ceiling. In the office, the wall opposite the desk is currently a mound of unpacked boxes set above a game table Drew purchased at the Evening Star yard sale last spring. We think the game table would be better suited as a coffee table. 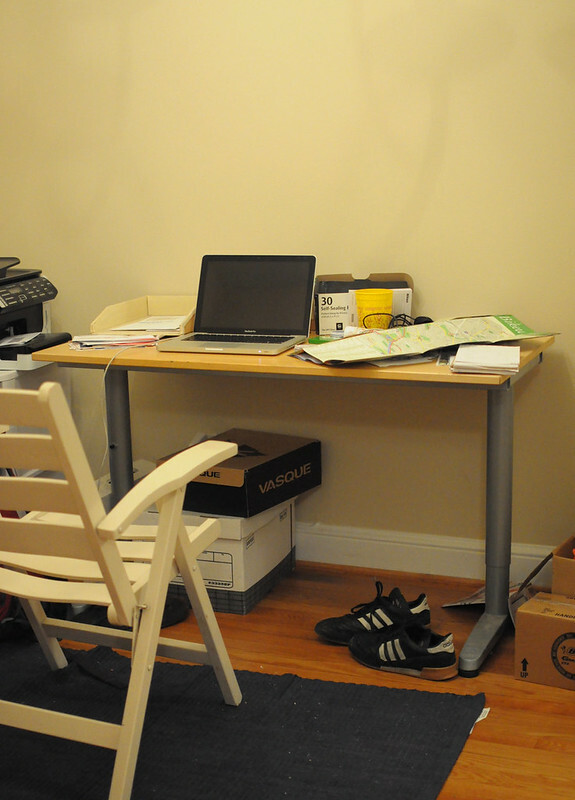 Along this wall, Drew should purchase a storage piece to help organize and declutter the office. 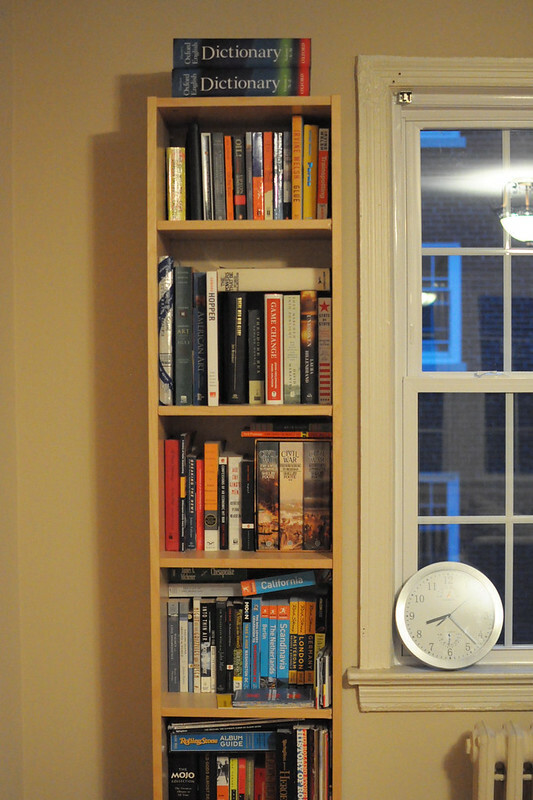 The Expedit (2×4) bookcase from IKEA (set either vertically or horizontally) immediately comes to mind. Expedit is sturdy and versatile and will keep files, books, and computer equipment neatly tucked away in its deep shelves. Bins, boxes, or even doors will make sure everything stays under control. During the day, there is no shortage of natural light through the large windows. 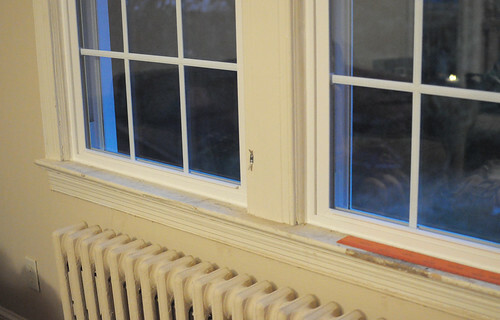 but these radiators limit furniture placement. A great way to make better use of this space would be to either build a removable radiator cover (seen in this house) or simply place a piece of marble or granite over the radiator to make a table. You can buy a slab of granite at a salvage yard like Community Forklift and have it cut to the size you want. A narrow slab of granite would enable Drew to add plants and other items to a newly crafted table. The apartment seems rather monochromatic — too many shades of solid brown, navy, and forest green. Although these make for a masculine color palette, they are all too dark and bland in this small space set off with a creamy beige wall color. Drew could add some visual interest with pillows, blankets and area rugs. For pillows we’re thinking something with a pattern — stripes, chevron, faux cowhide, or plaid. A gender neutral alpaca throw would also echo the cabin motif. And carpet tiles or an indoor/outdoor rug make sense for someone who’s contemplating a dog (i.e., they clean easily). Leslie and I are split about the bookcase. I think it adds some color to the room, but it’s a smidge overcrowded. Some of the books should be moved to another room (e.g., dictionaries into the office) and others could be displayed throughout the room — under a lamp to add height, on one of those new radiator ledges, or on a coffee table. The old pharmacy lamp from Pottery Barn would look great in Drew’s place. They have changed the style, but the older ones were super cool and would look good with the old history theme. Deck chair at the desk was cast out yesterday. Picked up a faux brown leather desk chair. Much more comfy! Looks great! The only thing missing is stone well in the basement. Needs color and mainly personality! You do not get his sense by looking at the place.